Tennessee Senator Lamar Alexander said Monday that he would not seek a 4th term in 2020. Alexander becomes the first member of Congress to announce their retirement since the 2018 midterms. It is possible Alexander would have faced a primary challenge from the right in 2020, as he did in 2014. That year, he defeated State Rep. Joe Carr by about 9 points to secure the Republican nomination. He then won his 3rd term by 30 points over the Democratic nominee. Democratic prospect for a 2020 win in this deep red state are not really improved. In the just-completed election - also for an open seat - a well-regarded moderate Democrat lost by double digits to the GOP nominee. Republican Arizona Sen. John Kyl will resign his seat at year-end. Kyl was appointed to the seat after the death of John McCain in August. The state's governor, Doug Ducey, will appoint a successor, who will serve until a special election is held in November, 2020. The winner of that race will serve the remainder of McCain's six-year term. The seat is next up in 2022. Possible replacements include Rep. Martha McSally who just lost an election to Democrat Kyrsten Sinema for the state's other Senate seat. The replacement must also be a Republican, although not an issue here since the just reelected Ducey is also a member of the GOP. The 2020 Arizona special election is looking like one of the more competitive races of that cycle, at least at this early date. Create your own forecast with our 2020 Senate interactive map. The 2020 Senate Interactive Map is now available. 34 seats will be contested in the upcoming presidential election year, 22 of which are currently held by GOP incumbents. That's a considerably different case than this year, when Democrats had to defend 26 of the 35 seats. However, most of the 2020 GOP-held seats - and one Democratic one - are in deep-red states, limiting the paths available for Democrats to retake control. 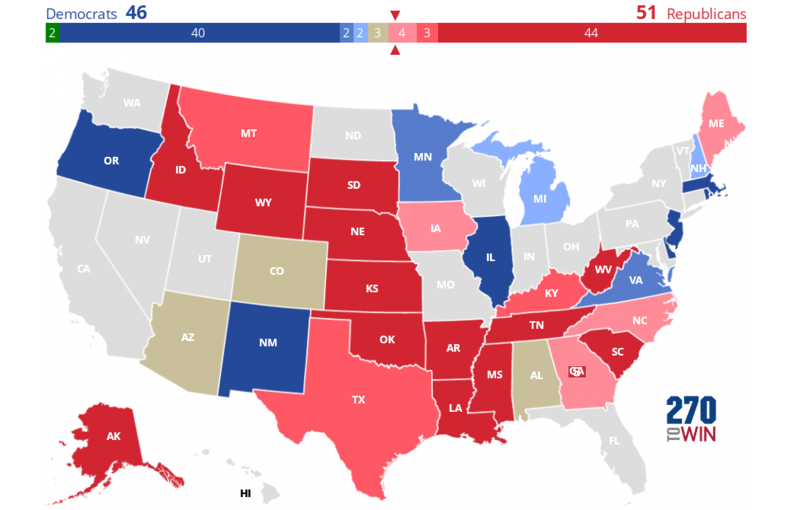 When the new Senate is seated in January, Republicans will hold a 53-47 edge. That means in 2020, Democrats will need to gain 3 or 4 seats to win the majority. The smaller number will come about if Democrats are able to win the presidency, as a 50-50 Senate tie is broken by the Vice-President. The interactive map lets you choose which party will win the 2020 election - use the 'VP' box near Florida. In a bit of good timing, the initial 2020 Senate ratings from Sabato's Crystal Ball are also out today. Click or tap the image below to start your own 2020 forecast. The initial ratings give the GOP 51 seats, although it could very well be 52. The reality - as noted in the Crystal ball article - is that starting Alabama as toss-up is being very generous to the Democratic incumbent there. This is particularly true in a presidential election year. The other two toss-ups, Colorado and Arizona*, represent the best Democratic pick-up opportunities in 2020. After this first tier of competitive races, Democrats could also find opportunity in North Carolina, Iowa and/or Maine, while the GOP would likely look to New Hampshire, Michigan and/or Minnesota. How much success either party has in flipping these states will likely be pretty closely tied to how it's nominee is performing in the presidential election. The importance of the presidential election is a key takeaway from the Sabato analysis: "the Senate races and the presidential race probably will work at least somewhat in tandem, meaning that it’s hard to imagine Republicans holding the White House while simultaneously losing four net Senate seats. So winning the White House is likely a necessary but not sufficient condition for a Democratic Senate takeover." * A special election to complete the final two years of John McCain's term. Gov. Doug Ducey appointed Sen. Jon Kyl after McCain's death earlier this year. Kyl - or perhaps someone else - will serve until 2020. This week, former Massachusetts Gov. Deval Patrick and attorney Michael Avenatti dropped off the list of prospective 2020 Democratic presidential candidates. Patrick informed staff and advisers on Tuesday, with a public statement expected in the days ahead. Avenatti announced his decision by Twitter, citing family concerns. That leaves 28 names on our current list of possible Democratic contenders. Only two, Rep. John Delaney of Maryland and former Rep. Ojeda of West Virginia have formally announced. We should have a pretty good idea of who is actually going to run within the next 2 to 3 months. All these names are available on the 2020 Interactive Electoral Map. Just click/tap 'Democrat' above the electoral counter and choose from the drop-down list. For those that have asked, we will be adding the 'tilt' ratings option to the electoral map in the near future. Maybe we're not done with the midterms after all. North Carolina officials have again declined to certify the results in the state's 9th congressional district. Allegations of voter fraud will continue to be investigated, and a hearing will be held on December 21st. The issues seem centered around absentee ballot irregularities, particularly in Bladen County. On Friday afternoon, the Associated Press retracted their November 9th call for Republican Mark Harris, who appeared to have won the race by about 0.6%. They are basically going to treat this situation as they do races with recounts. AP does not call winners in any election that is subject to recount. They may also be wanting to get out in front of this situation, after they were slow to retract their call in CA-21. The state board has the authority to call for a new election if "irregularities or improprieties occurred to such an extent that they taint the results of the entire election and cast doubt on its fairness." For more, follow this Twitter Moments thread from WSOC-TV reporter Joe Bruno. Following the 2018 midterm elections, the number of states with a split U.S. Senate delegation will drop from 14 to just 10 in 2019. This marks the fourth consecutive election with a decline. This is also just one above the historically low value* of nine split delegations set in 1955-56. The chart below, from a Pew Research study, shows the totals by state for the past fifty years, ending before this year's midterms. After Democrat Doug Jones won a 2017 special election in Alabama, 14 states had a split delegation. The 2018 midterm elections saw five states move off that list, with one added. Democratic incumbents in Florida, Indiana, Missouri and North Dakota were defeated as was the Republican incumbent in Nevada. All five of those states moved to a single-party delegation. Interestingly, these were the only five incumbents to lose re-election. The open seat in Arizona was a Democratic gain; that will now have one Senator from each party. As a result, in 2019, 22 states will have two Republican Senators and 18 states will have two Democratic Senators. * Since direct election of U.S. Senators began after the passage of the 17th Amendment in 1913. There were 48 states from 1913 until 1959. Independents are counted separately, even if caucusing with a major party. Democrat TJ Cox is the projected winner in California's 21st congressional district, defeating incumbent Republican David Valadao. This was the final House race to be called. Democrats have a net gain of 40 seats, and will hold a 235-200 edge on the GOP when the new House is seated during the first week of January. It is over for Congressman David Valadao in #CA21. His best county's provisionals reported today, and broke for the Democrat, TJ Cox. Outstanding votes are going to be more of the same. That makes a forty seat gain for the Democratic Party in the House of Representatives. Almost all media outlets had initially called the race for Valadao, who led by 8% on election night. However, his lead steadily shrunk as more votes were counted, and these same outlets were forced to retract that call. Cox took the lead for good two days ago. Seven of California's 53 congressional districts sided with Hillary Clinton in 2016 while re-electing a GOP member of Congress. All seven of these districts were flipped to the Democrats this year. That party will now hold 46 of those 53 seats. This spreadsheet shows the change in partisan composition by state as a result of the midterm election. Mississippi Republican Sen. Cindy Hyde-Smith won the state's special election runoff Tuesday. Appointed when former Sen. Thad Cochran resigned last spring, Hyde-Smith will now serve out the remainder of his term. The seat will be up again in 2020. With this result, the 2018 Senate elections have come to a close. The GOP maintains control, with a net gain of two seats in the midterm elections. They will go into 2019 with a 53-47 edgea. Overall, six seats changed hands. Republicans won seats in Florida, Indiana, Missouri and North Dakota, while Democrats were able to take the seats in Arizona and Nevada. Note that you may hear that Republicans gained one seat (not two) during this election cycle. This is accurate, with the difference attributable to the 2017 special election in Alabama that saw a Democratic gain. Click the image below to see the results for all 35 elections. We also have an interactive version of the 2018 actual results. For those that have asked, look for the 2020 Senate interactive map during the first quarter of 2019. All else equal, 2018 was a difficult year for Democrats, as the party had to defend 26 of the 35 seats that were contested (25-8 excluding special elections). Things will be somewhat reversed in the next two cycles, with Republican having to defend over 60% of the seats up in 2020 and again in 2022. As 2018 saw a two-seat gain for the GOP, the 2024 cycle will go from 25-8 Democrats to 23-10a. Note that the GOP number of 22 in 2020 includes a special election in Arizona. The winner will complete the final two years of the seat previously held by Sen. John McCain, who died in 2018. That seat is currently excluded from the 2022 counts. The final seat in the U.S. Senate will be decided today as Mississippi holds a runoff election. Polls close at 7:00 PM local time (8:00 PM Eastern). Live results will be available in the table below after that time. Reload the page for the latest totals. The runoff is between Republican Sen. Cindy Hyde-Smith and her Democratic challenger, former U.S. Rep. Mike Espy. It was necessitated when none of the four candidates in the November 6th special election received a majority of the vote. Hyde-Smith was appointed by Gov. Phil Bryant, taking office after former Sen. Thad Cochran resigned this past April. The winner of today's runoff will serve the remainder of Cochran's term. The seat is next up for a full six-year term in the 2020 election. Republican incumbent Cindy Hyde-Smith is favored in this deep-red state. However, the race appeared to tighten after several racially tinged controversies involving Hyde-Smith arose. Both parties added resources, and President Trump headlined two election-eve campaign rallies. Although Espy and Hyde-Smith were within 0.5% in the November 6th vote, the two GOP candidates together totaled nearly 58% - a 17 point margin over Espy. Interestingly, the party totals that day were nearly identical to Trump's 57.9% to 40.1% win over Clinton in 2016. The only subsequent poll, taken last week, gave Hyde-Smith a 54% to 44% edge in the two-person runoff. Regardless of the outcome, the GOP will retain control of the Senate in 2019. The party will have 53 seats if Hyde-Smith wins, which would be a net gain of two in the 2018 elections. Incumbent Rob Woodall prevailed by 433 votes after a recount in Georgia's 7th congressional district. At the time, this was the final uncalled race and it appeared Democrats would have a 234-201 advantage in January when the new House is seated. However, late today, our results partner Decision Desk HQ retracted their earlier call of a GOP win in California's 21st congressional district. They say that race is now too close to call. "Rep. Valadao’s lead has shrunk from over 4,900 and 8% on 11/7 to just over 400 with thousands of additional ballots left to count in areas favoring Cox. It is still quite possible for Valadao to hold his seat, but if he does, it will be by a very, very slim margin, certainly not the margin inferred on election night." As a result, the day ends as it began, with Democrats holding a 234-200 edge, and one race undecided.